The Diet Tracker Food Scanner will help you keep track of your diet and also enable you to read nutrition facts by just scanning the barcode. It is a multiuser application so it can be used by multiple people on the same device. So the whole family can keep track of their diets. You can learn how to use this app here: www.youtube.comuser3GuysAndAnApp. 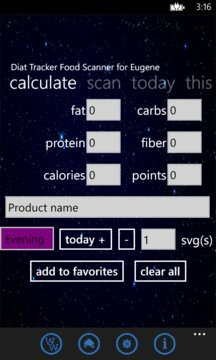 This app will calculate points based on the nutritional content. The calculated points should be the same as Weight Watchers PointsPlus points. So if you have a Weight Watchers account you could use this program to keep track of your points offline but you also have ability to access Weight Watcher's from the application by using WW button. This program will keep track of the nutrition value in the food you are eating and the calories as well. This app can calculate your allowed points for a day or you can set the number of points to any value that you would like to keep up with. It will also calculate your activity points and calories burned from exercise through three different methods by your activity level, by heart rate or by activity type. It will store your favorite foods in the local database and will allow you to read its nutrition just by selecting it from the list. It keeps your diet information for two weeks for which you can see and edit your points, nutrition, calories and weight. it has Restaurant Nutrition and Menus database allowing user to build their meals and see its nutritional values and Weight Watchers points. This application has already started building it’s barcode database with corresponding nutrition information of different products. But there will be a lot of products that are not entered yet but you have the ability to enter new products in the database. This information is shared among the community of all application users, like yourself. 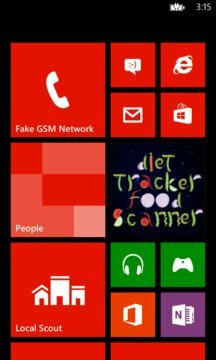 This application has an active tile and pined to the start screen will show your used and left points and calories for the day and the week.